Spill from Neyrinck allows you to fine tune the channel levels on surround audio and bus tracks - easy to use with Avid Eucon controllers such as S3, S6 and Pro Tools Dock as well as Neyrinck's V-Plugin app for iOS. Spill makes it fast and easy to adjust channel levels on surround audio and bus tracks, just like the “spill” feature found on high-end digital film consoles. 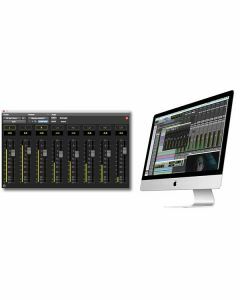 It is available as an AAX Native, DSP and AudioSuite plug-in for Pro Tools. Spill AAX plug-in also includes the V-Control Pro Bundle with V-Console, V-Panner and V-PlugIn apps. The Spill AAX plug-in can be inserted on any multi-channel Pro Tools track, aux or master, from stereo to 7.1 format. Finally there is now a way to control the individual channels in a multi-channel track that are spilled onto the plug-in’s faders. Channel levels can then be adjusted – for 7.1 the plug-in has 8 faders, meters and gain values. Spill can be controlled from Neyrinck’s V-PlugIn app for iPhones and iPads as part of the V-Control Pro System. Avid’s EUCON controllers, such as Pro Tools S6, Pro Tools S3 and Pro Tools Dock, can also control spill adding this valuable feature to these control surfaces. Channels in the Spill plug-in can be grouped together for fast and easy control, very useful for pairing L/R or the surround channels. Simply click the channel designation above the fader to add or remove that channel from the group. The grouping is relative, with the relative levels of the faders locked when they are added to the group. This makes it easy to set an offset and then group multiple faders together. Moving any fader in the group adjusts the levels of all faders in the group. Hold down Command key on Mac, or Alt on a PC, for fine fader adjustment mode for precise control. The AudioSuite version is very useful for editorial where individual clip surround channels may need adjustment throughout the clip. For larger sessions and final mix, the AAX DSP version is perfect for reducing latency and providing powerful control of all groups. Although the S6 control surface can spill out VCA groups it cannot spill and control individual channels of a multi-channel track or bus. The Spill plug-in now allows engineers to access this feature from the S6, either from the channelstrip knobs or across 8 channelstrips with Expand Mode. The ‘Sel’ button allows channels to be added or removed from the group. The first knob ‘In’ button acts as bypass. The S3 can also control Spill from the knobs. Plus you can flip the knobs to the faders making it even easier to control your spilled channels. Spill is the first plug-in to support the powerful new V-PlugIn App for super-fast access to tracks and their plug-ins from iPads and iPhones. V-PlugIn app is part of the V-Control Pro Bundle and is included with the Spill plug-in. The V-PlugIn App shows a list of tracks using Spill so a user can just tap the track name and have instant access to channel levels without needing to open a plug-in window on the computer. Channels can be grouped/un-grouped simply by touching the channel designation above the faders.